Our Plymouth MI hair salon, located in the Old Village District, is the kind of place where old meets new. Our vintage architecture and classic style welcome clients of all ages. 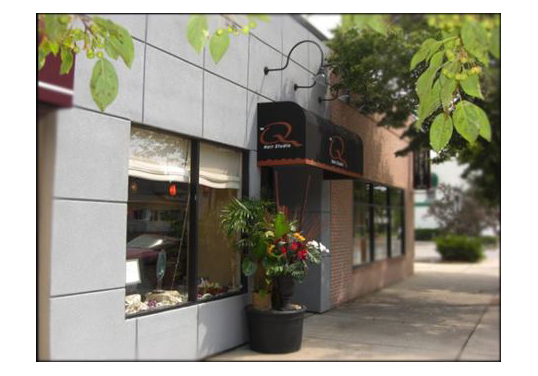 The Q-Hair Studio is a salon specifically designed for professional and independent contractors in the beauty industry. Our talented stylists, nail care specialists and team members have been in the industry for as many as 20 years or more. At our hair salon, excellence and superior service is to be expected. Our hair salon has a strong belief in continuing education. We are on the cutting edge of new trends and try to educate our clients on how to maintain a timeless and distinguished personal style. Some of our stylists are educators and do or have done platform work. You’ll look nothing short of fabulous. Our professional stylists will design, shape, and color your hair with the most advanced systems in the industry. At The Q Hair Studio, we specialize in custom haircuts for women and men, keratin smoothing treatments, as well as hair color. We also offer beautiful custom wedding hair and makeup, and shellac manicures and pedicures. Our team of hair color specialists and professional stylists are proud to offer the beauty industry's best techniques and the latest trends in style. We strive to exceed your expectations, while meeting your needs. Book an appointment with one of the talented stylists at our Plymouth MI hair salon. Our expertise will provide you with exceptional results, making you feel rejuvenated and most importantly, happy!